We tend to think of cataracts as a normal byproduct of aging, whether we are talking about our grandmother or our four-legged friend. Age isn’t the only reason cataracts develop; there are many medical reasons that our pets may develop cataracts. Contact your veterinarian immediately if you see any change in the appearance of your dog’s eyes, or you think your dog’s vision either has deteriorated or been compromised. Cataracts result from a disease process affecting the lens of the eye, causing the lens to lose its transparency and thus impairing vision; in some cases, cataracts can even cause blindness. The lens of the eye becomes thick and opaque, resulting in a whitish/ gray area in the center of the eye. Cataracts may progress slowly or rapidly, depending on their underlying cause. There are a number of reasons your dog may develop cataracts. The most common cause is genetics. Diabetic dogs are especially susceptible to developing cataracts. Other causes include diseases, nutritional disorders from puppyhood, eye injury, or infection. 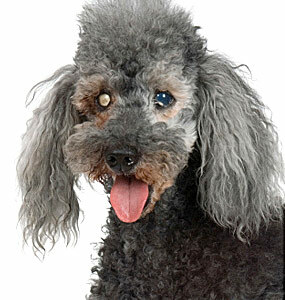 Most cataracts develop with age, but shouldn’t be confused with nuclear sclerosis, a normal change of the lens in pets over 7 years of age, which causes the lens to appear somewhat whiter or grayer but does not seem to impair the dog's vision. In order to diagnose your dog’s eye condition, your veterinarian will perform a complete history, a physical examination, including an eye examination and certain tests to evaluate the eyes. Additionally, they may recommend the following, depending on your dog’s specific needs. The treatment of your dog’s cataracts will depend on the underlying cause, his stage of development, and his overall health. Routine eye exams as part of your dog’s yearly physical will help in monitoring her eye health. If there is an underlying cause, treating the underlying disease may improve your pet’s prognosis. Finally, dogs with progressive cataracts, that are not candidates for surgery, can learn, with help from their owners, to cope and compensate for the loss of vision with their other keen senses, such as smell. Your veterinarian will help you by providing sound advice about caring for your friend, should she develop cataracts.